Would love to know if either of these strike a chord. Thanks Jay (@jaysmet), with due credit to Beth Noveck and David Johnson for their complexity research. I’m just hoping to apply it. Yes, both of your posts strike a chord. I especially like your core “iterative model building” approach, and the extent to which you’ve developed scenarios for interaction. As recently as this morning I was brainstorming alternative processes for online group collab. I plan to post soon to summarize experiences in web-based collaboration vehicles using chat, thread, map, merge/remix and repository elements. Appreciate your interest and desire to engage. Let’s talk further 1:1 (I’ll DM/EM). Enjoyed your post Chris and the obvious thought and study that went into it. Having had several chats to you about the subject, and knowing how you approach this subject, I know you do not say things like “what is needed is an outright paradigm shift” lightly, or without consideration for the issues that surround that. Indeed organizations that are able to find this “sweet spot” will hold an important competitive advantage in a world where retrospective measurements and reactions are still important, but are not enough to keep up with the real-time expectations and demands of the market. 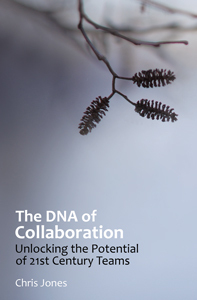 Opening up the collaboration process, while still keeping it protected is indeed possible. We all understand that there are different levels to collaboration and an open ethos does not necessarily equate to carelessness or exposure. Thanks for getting the grey matter working. Great feedback Alasdair (@ajmunn), thanks for your comment. I am having more conversations every day about ecosystem challenges. Issues of ‘complexity’ and ‘barriers’ are raised often. But I’m encouraged to hear grass-roots collaboration is being raised often as well, as an alternative. Just today I heard a senior government official talk about the need for some ‘change to come from the outside’ .. a call to action, for certain .. but a key realization that silo’d governments can’t be expected to find all the answers. As outlined above, with SM, individuals can step in and take part. Thats a new mindset and a culture change, so it will take some time to catch-on. But I do see it starting to spread. The paradigm is starting to shift. So it sounds like we agree on the ‘why’. We still have work to do on the ‘how’, though we’re making some headway, w/ groups like SMCHAT. I’d like to start addressing some key steps in future posts here, and have heard others are doing the same (I’ll try to keep tabs on progress, with links here). Meantime, the ‘what’ is a pretty long list. Where do we start?